Improving animal welfare in poultry slaughterhouses. How to reduce stress, suffering and ease handling. 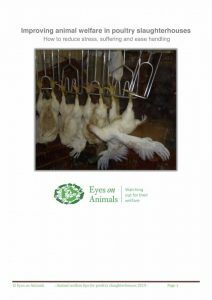 In recent years, Eyes on Animals visited many poultry slaughterhouses worldwide – to help reduce suffering, injuries and mortality (DOA’s). We obtained a lot of practical knowledge based on our observations of bird behavior, the handling of the birds and the design of the slaughterhouse facilities and equipment. With help from industry – we developed this best practice report with photos. Please click on the report on your left.